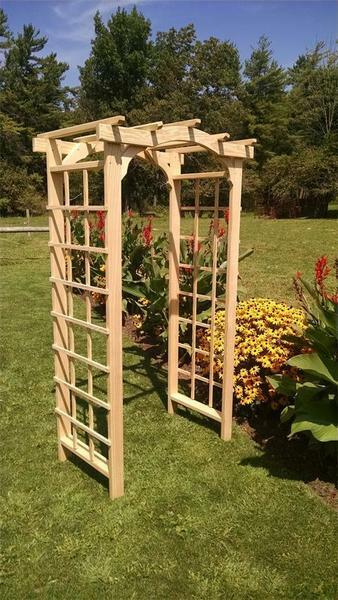 Our American Made Madison Garden Arbor has a beautiful archway that will allow you to create a grand entrance in your outdoor space. Train climbing roses to set your space apart even further. Choose between our untreated, Southern Yellow Pine Wood or our Western Red Cedar, the most preferred of all the Cedars. Then finish this piece off in your choice of our variety of stain options that will surely suit any backyard. Made in our Pennsylvania wood shops, you can count on the high-quality craftsmanship that is put into every piece. If you plan on using this piece for an outdoor event, its integrity will remain long after the occasion is over. Enjoy your arbor for many seasons to come! Delivery is without a liftgate service and requires an appointment. If you would like to order a liftgate with your delivery, please call us at 1-866-272-6773. There is an additional $75 charge for a liftgate. Note: It is common for pine and cedar wood to have some cracks appear especially in the hot summer months. The wood expands in the heat of summer but will contract when the weather cools down. These cracks are normal and we will not issue refunds due to minor cracks in the wood.